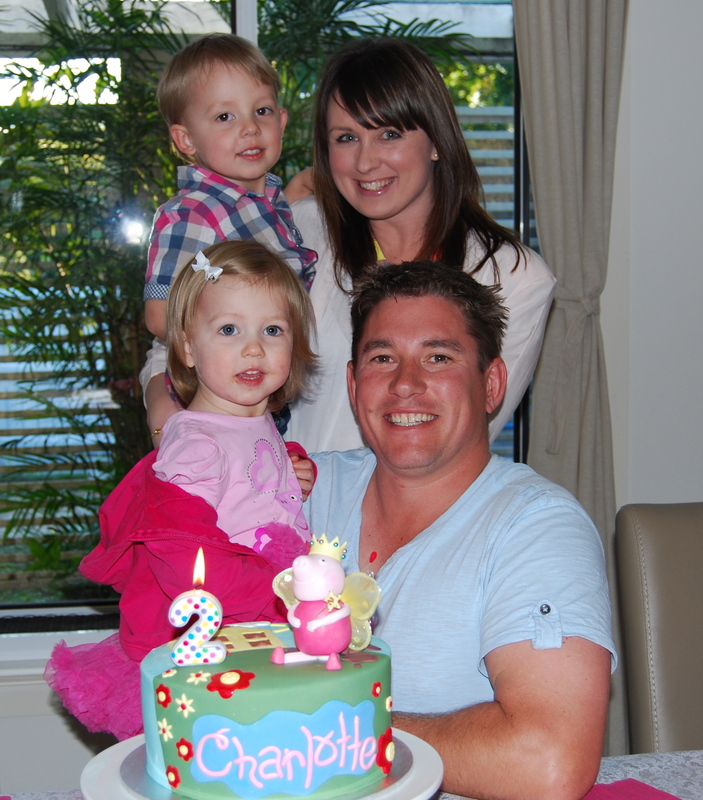 Charlotte's Peppa Pig Second Birthday by Elise Easdown, Managing Director of Whats on 4 Little Ones Australia. We are all fans of a family of lovable pigs in the British series, called Peppa Pig. 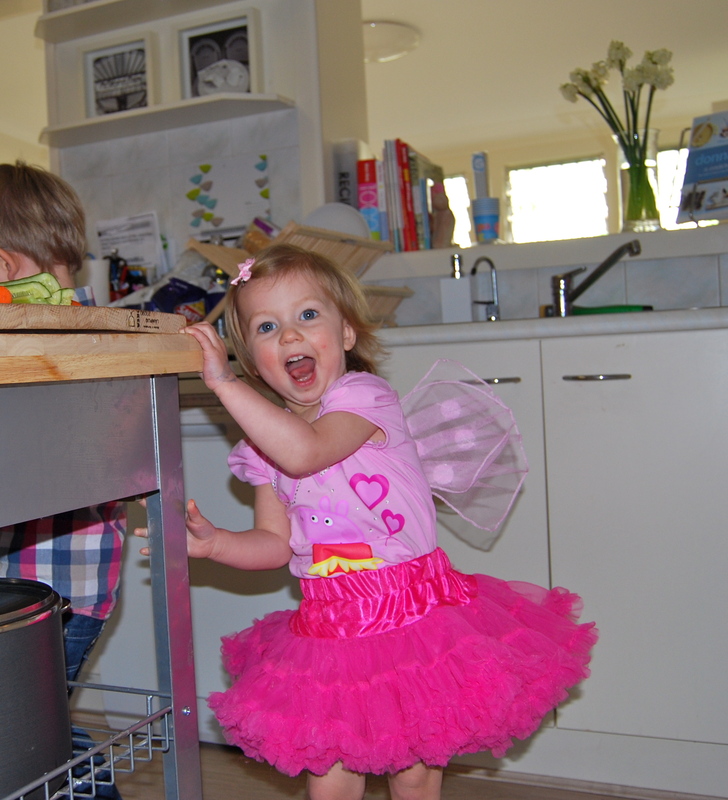 Peppa is the older, slightly bossy sister and George is her little brother that loves dinosaurs. 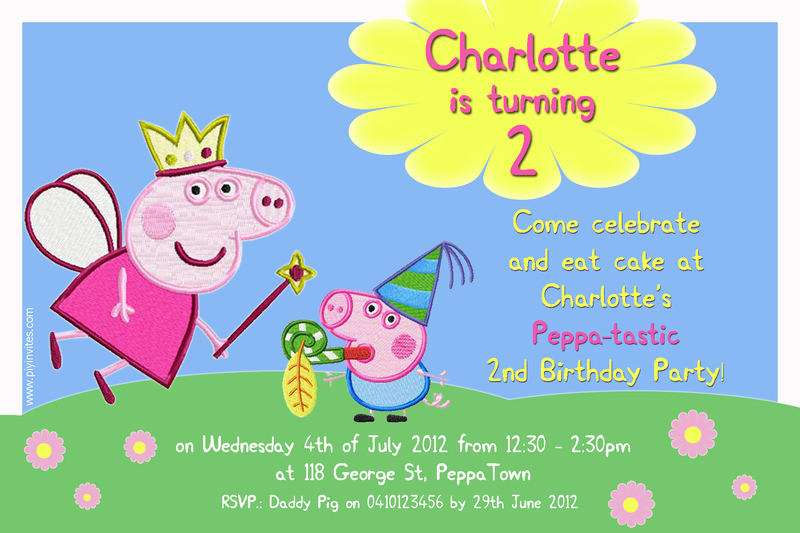 So it made sense to mark the occasion of my daughter, Charlotte turning 2 by having a Peppa Pig themed party. 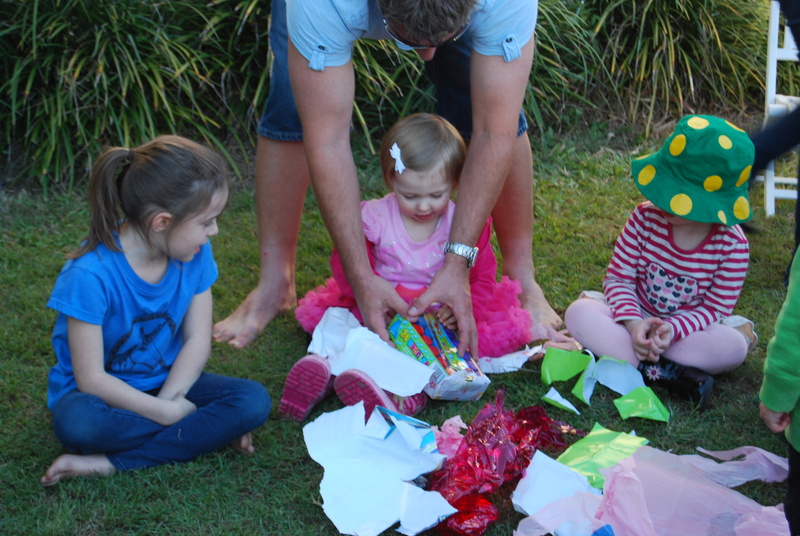 We ended up having about 15 adults and 15 children coming to the party, which we had at home. www.piyinvites.com made the invitations for me which came with envelopes and a little magnet on the back, perfect for the fridge. We still have ours on the fridge as my little ones love going back and looking at it, it’s a lovely reminder of a special day. I’m sure some of our guests without children were wondering what these little pigs were all about though. But their questions would have been answered at the party. 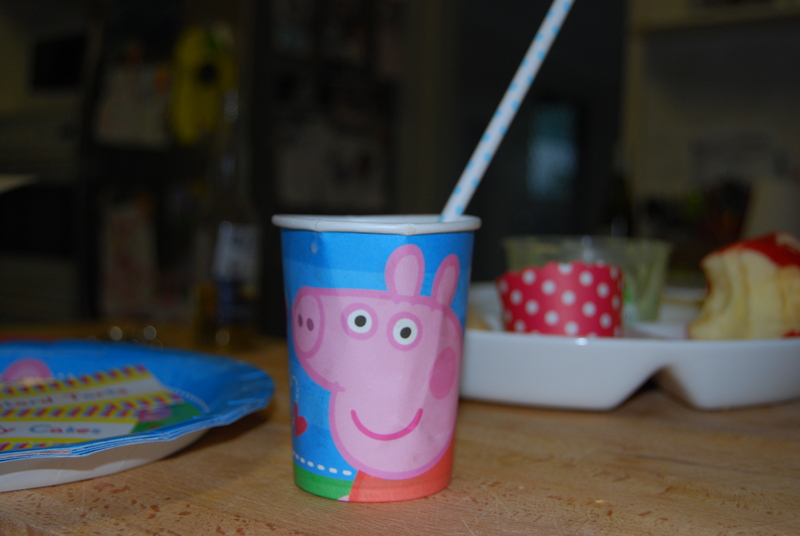 We had tableware from http://www.characterparties.com.au/, including cups, plates and lolly bags. I also grabbed from Target, some plain matching pink smaller plates, bowls and serviettes as I didn’t want everything to be to matchy-matchy. 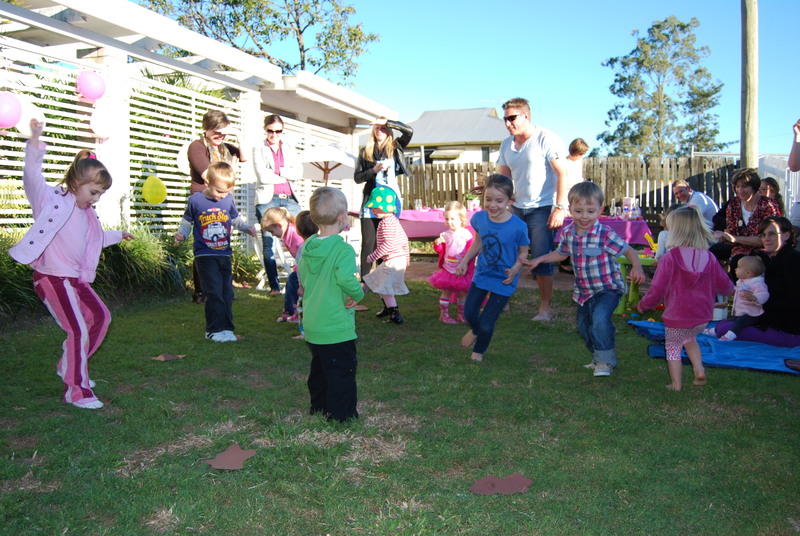 http://www.characterparties.com.au/ have a great range of Peppa Pig merchanise including clothes and shoes, party ware and soft toys. 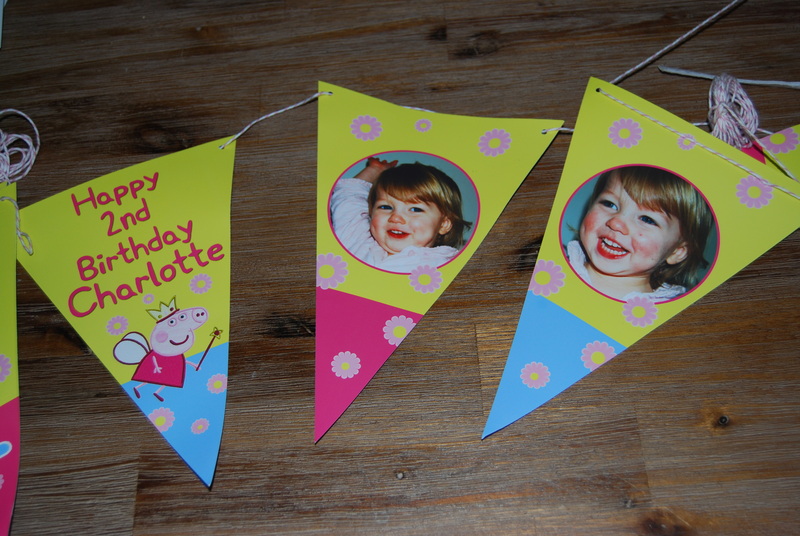 www.piyinvites.com also made some custom food labels, drink wrappers that we could write the children’s names on and gorgeous bunting with photos of our little girl. For other decorations I had tissue paper pom poms ($18 for 3) and circular colourful fans ($5 for 4) from Spotlight and hung these from the veranda and the Frangipani tree which over hangs our front fence. 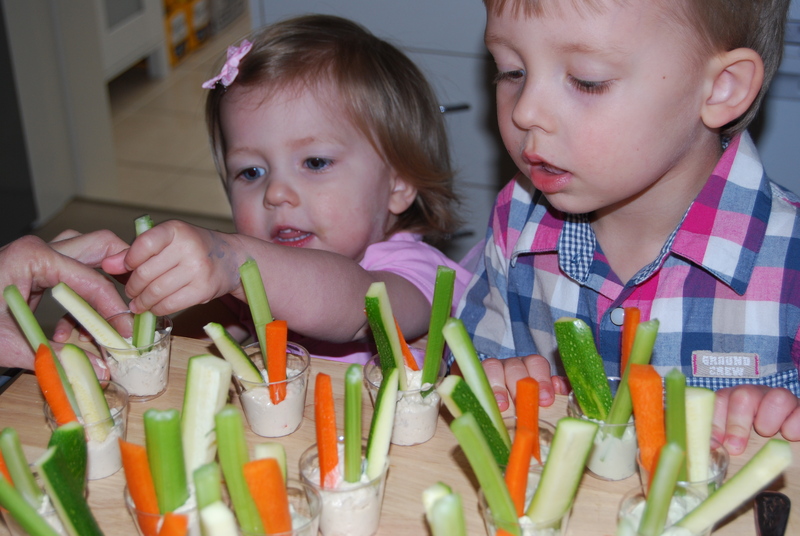 I asked my kiddies what food you should eat at a party and this is what they came up with. 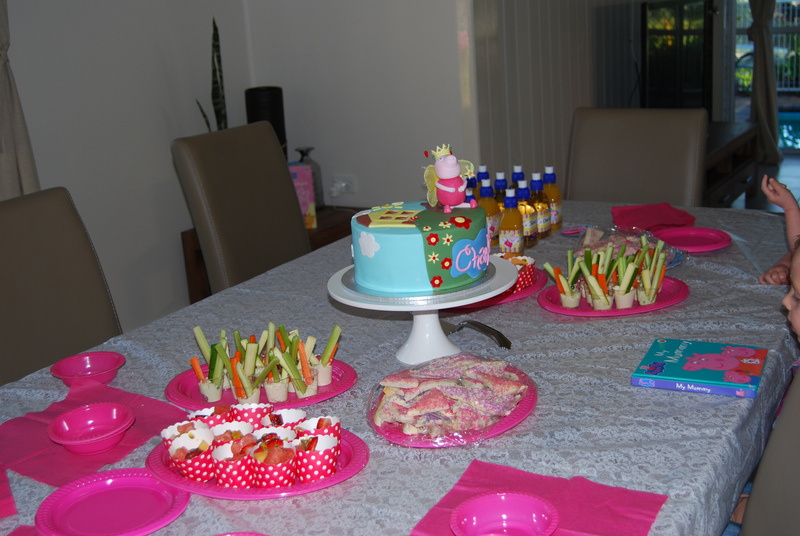 Food was a mixture of ricotta and spinach pastries, spring rolls, sausage rolls etc and then I made custard tarts, pink jelly cakes, vege sticks and dips (perfect for avoiding re-dipping) , fruit salad in cupcake cups, hot pop corn, fairy bread and milkshakes which we had with the cake. 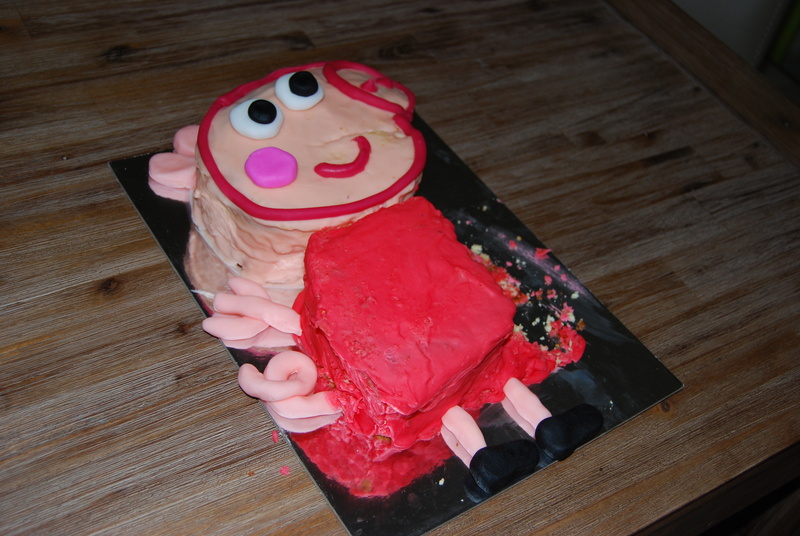 The ‘Ah-Mazing cake was made by MommyBakes – Brisbane. It was a chocolate cake filled and frosted with chocolate ganache…. 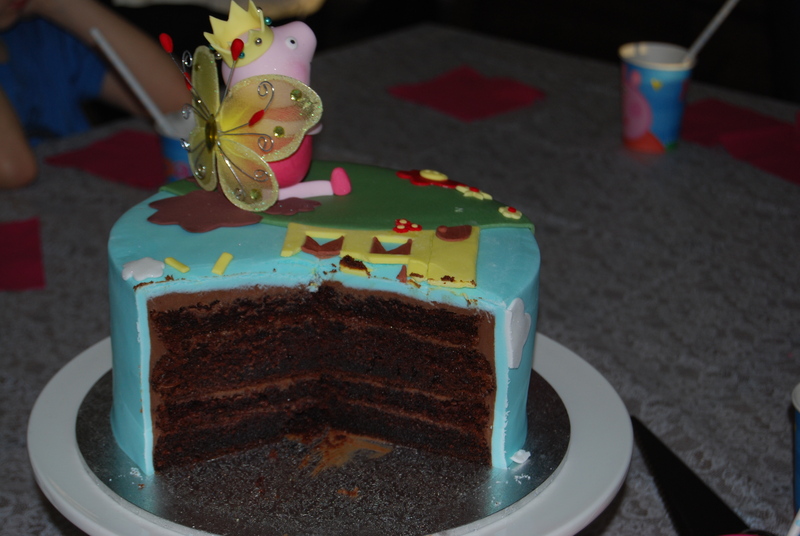 We continued the theme with the Princess Peppa Pig and had her featured on a green hill with a house and her name across the front. The dark chocolate really made it appear like earth underneath all the fondant. It was delicious and a huge cake which meant there were left overs for the next day. For the games we played ‘Jumping in muddy puddles’, a take on Musical Chairs and also Pass the Parcel. 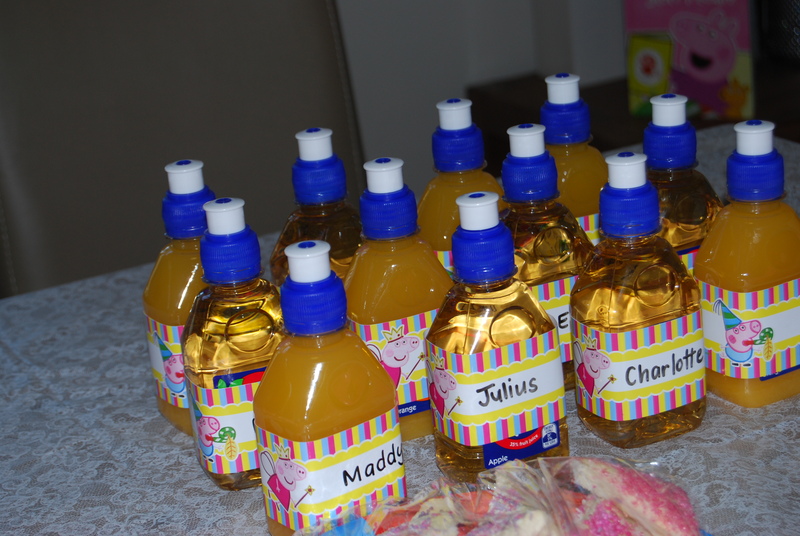 The prize was a small bottle of bubbles for everyone, which they then played with, along side the bubble machine going. 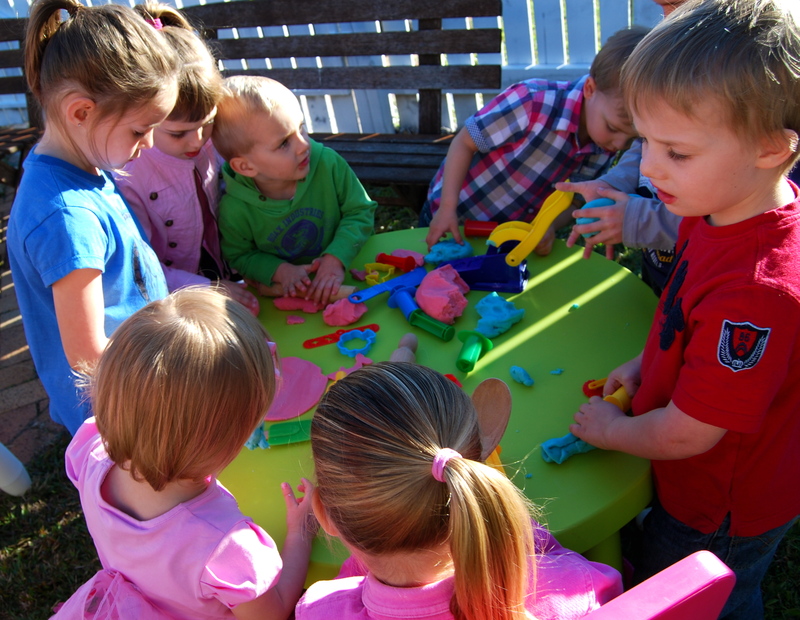 I made up a big batch of Peppa Pig pink coloured playdough and George blue coloured playdough, which they all seemed to love and spent quite a bit of time doing, which was great as it gave the adults time to mingle and eat. The two hours went really quickly but was just the right time. 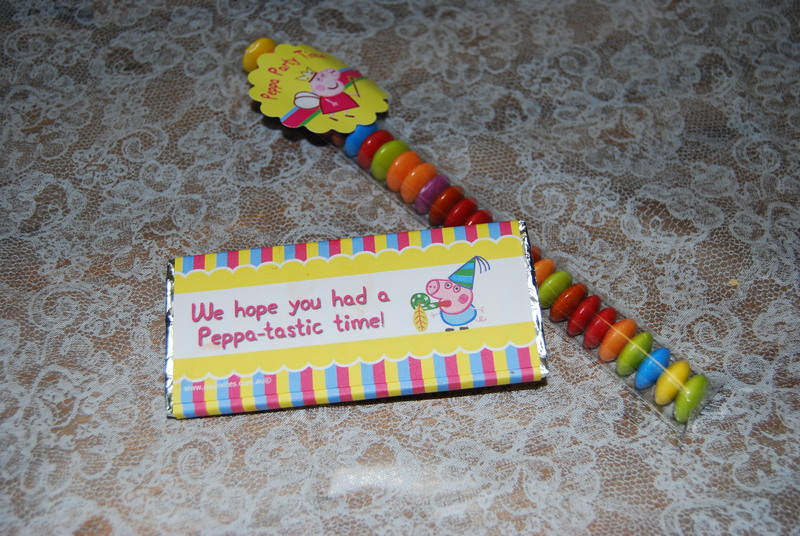 Guests went home with a party bag with some more goodies from PIYInvites, chocolate covered bars and lolly tubes with smarties. I had planned to give them a ball of playdough each to take home but ended up forgetting. We had a wonderful day and was so happy with the weather and how it all came together with the theme. 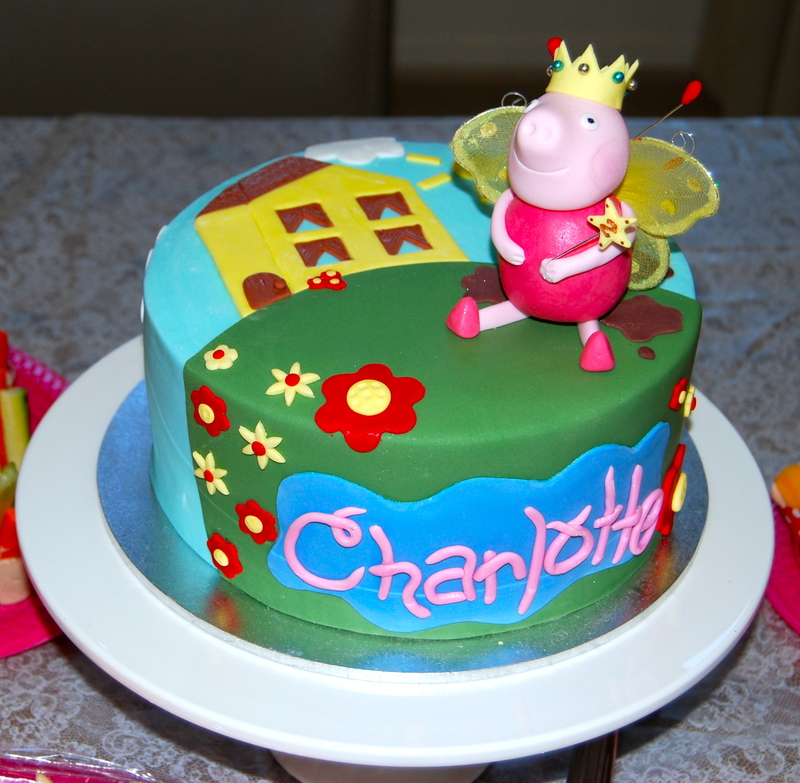 For Charlotte’s actual ‘birth day’ cake, I made the Peppa Pig themed cake from Cake 2 the Rescue. I was really impressed to receive email confirmation of the order being shipped and the delivery process, it was delivered to my door and I couldn't ask for anything better than that. It’s pretty exciting opening the box, it’s jammed pack with flour, fondant, food colour, cake board, cooking tray and even a serving knife! The instructions were really clear and illustrated which made it so simple to follow. I just needed to add 5 eggs and milk and before I knew it the cake was in the oven baking away. Once cooled the cake was easy to cut into shape with the templates provided. I was a little nervous adding the colour into the icing mixture as there’s no going back with colour and I was picturing a very sun burnt Peppa Pig if I was too heavy handed!! But it was all okay. The icing is easy to spread and there is enough (I was a little worried at one point) to cover the entire cake. The fondant is already pre-coloured for you, which is fantastic and creating the eyes, arms, legs and shoes is just like using playdough. My little ones helped make the eyes. I’ve been really impressed overall by Cake 2 the Rescue. 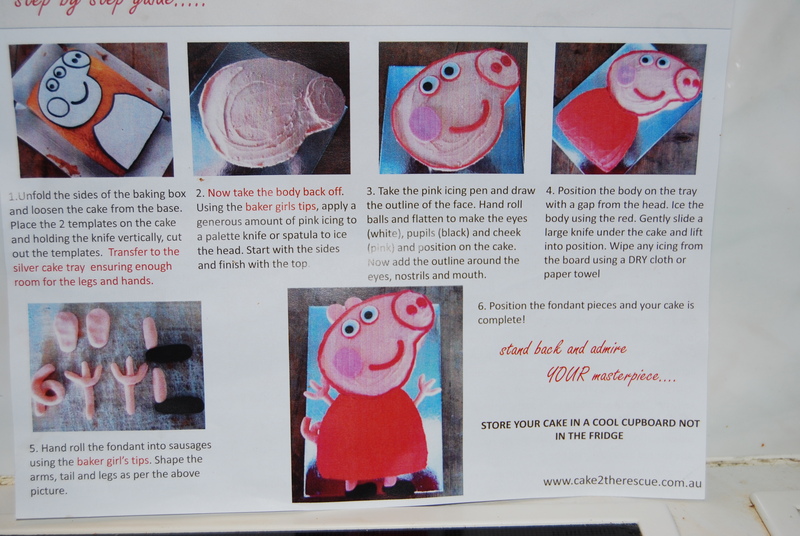 The girls have obviously thought about everything you’ll need to succeed in making your child’s birthday cake, they’ve even included the candles! 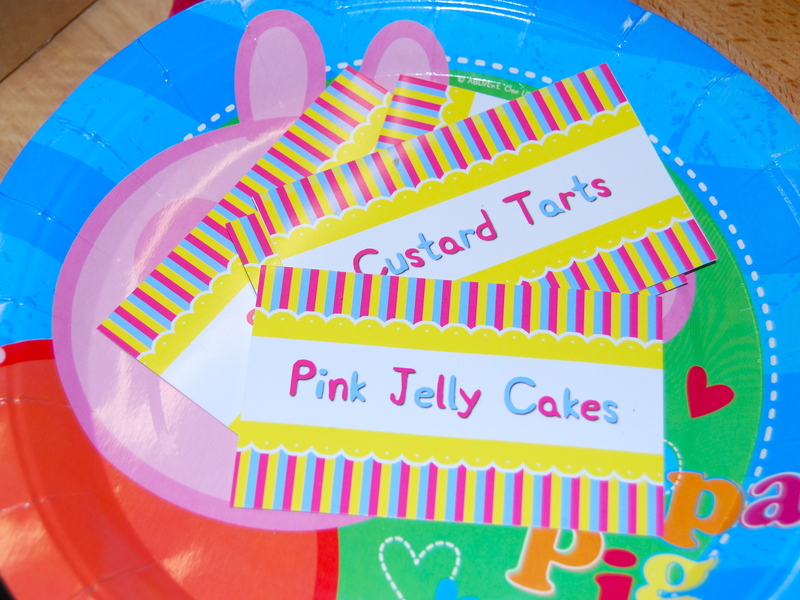 I hope you’ve found some inspiration for a Peppa Pig party.